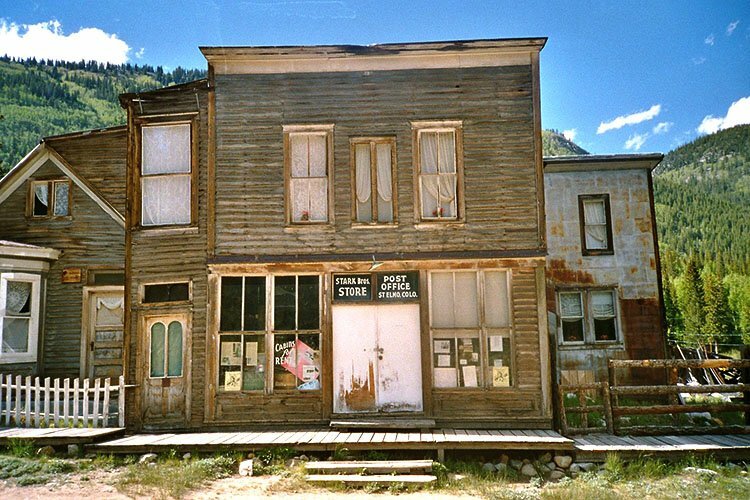 From boom to bust, the preserved ghost town is not just haunted by tourists. 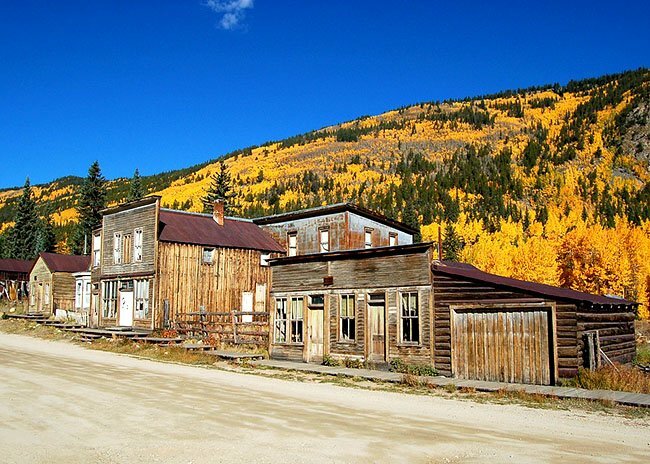 A beautiful drive down a forest service road off of Highway 285, nestled in the Sawatch Range, rests one of America’s best-preserved ghost towns, St. Elmo. Its rich history and restored buildings attract tourists and vacationers every year from all over the world. While there are a few souls who live year-round in the St. Elmo area, but the ghost town has more full-time residents than meets the eye. St. Elmo came into being in 1878 (then called Forest City), and quickly grew to a population of 2,000. By 1881, it was a station on the Denver, South Park and Pacific Railroad, and proved to be a thriving mining and railroad community. However, like most towns in the West, the boom didn’t last, and when the railroad line moved out of town in the 1920s, it was abandoned. During the boom years, the Anton and Anna Stark family (no relation to the Starks of Winterfell) came to town and became prominent members of the community, working at the mine and running the general store and Home Comfort Hotel. It was in this hotel that the beautiful young Stark daughter, Annabelle, as well as her brothers, spent most of their time. Anna thought her children were too good for the miners, prostitutes, and railroad men, and discouraged any socializing, besides with each other. When the town went bust, the family tried unsuccessfully to re-open the mine, and then turned to renting out the cabins and opening the general store to tourists for a living. It didn’t work, and Annabelle was eventually sent to Salida to work, which led to a very short-lived marriage. It’s not known what happened, but she soon landed back in St. Elmo to live with her remaining brothers and mother. By the 1930s, Annabelle and brother Tony were the only two people left in the decaying ghost town. Their sanity was quickly crumbling, along with the structures around them. It was rumored that neither bathed or changed clothes often, and both would have been considered a hoarder supreme. The hotel quickly filled up with trash, and Annabelle garnered the nickname “Dirty Annie” when she would visit Salida for supplies. While always courteous to those who visited St. Elmo, she was also fiercely protective, making rounds with her rifle to keep outliers away from her property. Safety became a concern for both the siblings and visitors, and both Tony and Annabelle were sent to a mental institution. Though they were released a short time later, Tony passed away and Annabelle lived out her days in a nursing home, dying in 1960. Their remaining property in St. Elmo fell into the hands of friends. Are those flowers in the windows tended by Annabelle (or does the current owner just like to mess with us)? Stark Bros. store in St. Elmo. It appears that, like before, Annabelle found her way back to her home. Not long after her passing, the new owner’s grandkids were playing in a room of the hotel, when out of nowhere, the temperature plummeted and all the doors slammed shut. Needless to say, that room became a no-go zone for the family. In addition, any attempts to clean up the hotel resulted in tools piling up in the middle of rooms, even after they were padlocked in a closet after the work day was over. Residents and renters in the area are no strangers to Annabelle’s ghost, either, and in the 1970s, a skier reportedly glimpsed her staring out of a second-story hotel window. As the place was empty and locked up tight, it was a surprising sight. Even more surprising, the “woman in white” was staring at a pack of snowmobilers illegally riding up Poplar Street. The skier flagged them down, made them aware of the rules and sent them on their way. When she looked back to the hotel, the woman in the window gave her a nod and simply vanished into thin air. Shortly after, the owner of the building and the skier conducted a thorough search but could find no trace of anyone having been in the old structure. Is Annabelle still watching over St. Elmo's streets? You decide! Most of the buildings are privately owned, but you can scare up a little fun walking the streets, peeking in a few windows, and visiting the few structures that are open to the public from May to October. As you stroll, keep your eyes open for wildlife, old relics from a bygone mining era … and, just maybe, a woman in white ensuring you mind the rules. If you are headed to St. Elmo via Highway 285, stop by Fairplay to get a double dose of eerie goings-on. Make an overnight trip of it, and check into the town’s Hand Hotel. Boasting several haunted rooms, the rustic bed and breakfast is allegedly host to full-body apparitions, otherworldly little girls and Grandma Hand, herself. “Park County abounds with tragic history that makes it ghost-ripe, including smallpox, miner accidents, snowstorms, stagecoach robberies, and even a doctor…burying fetuses in the basement of the Hand Hotel in Fairplay,” wrote theflume.com. Have you seen something strange in the neighborhood (of St. Elmo or Fairplay)? Share your stories and pictures in the comments below! Interested in more spookiness? Read about other Colorado urban myths and legends!